Pimpex Plastic, China supplies Automatic High Speed Extrusion Blow Molding Machine HFBC45 Series. Lead Time: around 40 days after Seller's receipt of prepayment. The blow molding machine model HFBC45 series can produce various milk bottles, cosmetic containers, cruet containers, drinking bottles, pharmaceutical bottles, cooking oil containers, transfusion bottles, lubricant oil containers, antifreeze liquid containers, chemicals containers, food containers, and others hollow containers like some small toys, industrial and agricultural fittings. 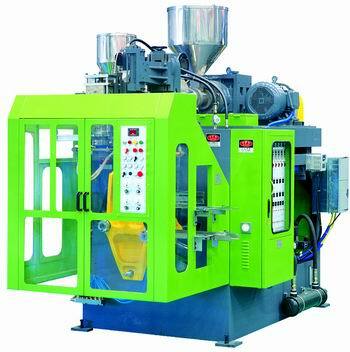 The machine is especially designed for producing with material such as PE, PP etc. The product capacity can reach 1200 cycles per hour (idle circle). Die Head: Center feeding materials die head or side feeding materials die head. Extrusion System: Adopts world famous brand automatic temperature controlling device. Drive the screw with frequence converter and deceleration box to realize stepless speed regulating. Clamping Device: Adopts dual shafts single cylinder two directions synchronous clamping organ, good stability. Hydraulic System: Adopts dual liquid vane pump for pump oil, adopts proportional pressure controlling circle for hydraulic system. Electric Controlling System: Adopt programmer controller and world famous electrical components. ---Total USD52,078 including one whole set of spare parts. 2. Mould Price: Pricing according to sizes and shapes of customers' containers. Wiring, tubing and materials, which are outside of machine. Materials, lubricating oil and hydraulic oil for test running. Transportation costs and insurance fee. If Buyer needs Seller to send engineers to Buyer's plant for installation and commissioning and test running, all to-and-fro flight tickets, hotel, food, insurance should be paid by Buyer. 4. Payment: 40% T/T prepayment, 60% T/T payment after Buyer's approval on machine quality in Seller's workshop. 5. Delivery: Delivery no later than 55 days, after Seller's receipt of prepayment and after mutual confirmation on all technical and commercial items. 7. Installation & Commissioning: Buyer should place the machine to the right position after the machine reaches Buyer's factory, and inform Seller, who will send technician to test run the machine until it is running in normal state. Buyer will pay the to-and-fro air tickets, accommodation, and hotel and so on for Seller's technician. And Buyer will pay USD35/day/person as technician labor cost when he leaves Seller's factory until leave Buyer's plant. 8. Quality warranty period is one year. That is, Seller is responsible for any manufacture related quality problems; those damaged components should be returned to Seller for replacing new ones. Each component has unique computer number following ISO9001 Certificate of Quality Management System and USA Symix ERP system, thus Seller could offer fast and close after services to customers in time. 9. This offer is valid within 30 days from the issuing date. Seller keeps rights to update prices and technical parameters if this offer is overdue and invalid. The offer is offered for Buyer's reference in making a decision and it isn't an enclosure of contract. Gear box adopts some bigger model with top grade hard gear tooth, which is a professional one for plastics machinery, to insure durable usages. Extrusion screw has been optimistically designed; reliable plasticity, excellent colors mixture effect, and different professional screws are available to match the machine according to different plastics raw materials. The barrel adopts forcedly feeding design to insure stable extrusion, high efficiency and energy saving. The screw and barrel adopts top grade nitrided steel 38CrMOALA to rapidly improve the abrasion and services life of screw and barrel. Heater adopts cast aluminum heater with outer heat insulation layer and stainless steel shield, there is a air cooler at the top of cast aluminum heater to let machining temperature accurate and stable. The platform of extrusion blow molding machine has lifting device for conveniently adjusting the heights of mould heads of different moulds. And the distance between mould and the mould head could be minimized to save flashes of containers most. The system could realize front-rear, right-left adjustments for conveniently adjusting process to meet with requirements of different containers. 3. Mould Head: Whole structure adopts continuous materials extrusion, first in first out (FIFO). The molded performs have uniform wall thickness and good surface quality, convenient replacement of colors and materials. All kinds of mould heads like single mould head, two mould heads, three mould heads, four mould heads, transparent line mould head, bilayer mould head and materials storage cylinder mould head could meet with requirements of different containers. Good exchangeability among various mould heads could make full advantage of one set extrusion blow molding machine with various mould heads. Optional wall thickness control system is available for each mould head to precisely control thickness of containers. Heater adopts stainless steel heating rings, automatic temperature controller. Mould head adopts special alloy steel to guarantee smoothness of mould runner and hardness of mould surface. 4. Mould Clamping Device: The mould open/close system of HFB series machines adopts patent design of two shafts single cylinder two ways synchronously clamping organ, the mould moving system adopts slantways mould moving method to let performs cutting off more easily, less impaction, fast and stable running. There is a bar stay organ at the bottom of mould plate to balance torques arising from blowing and mould itself and guarantee quality of containers. 5. Blowing Device: Optional single head blowing device, two heads blowing device, four heads blowing devices. Different mould head could be equipped with related blowing device. The blowing device has three ways displacements adjustment organ to adjust blowing device up-down, left-right, front-rear conveniently and fast, and to meet with requirements of various containers. According to different process requirements, the descending speed of blowing pin is adjustable, the blowing device has micro pumping function which could exhaust air quickly after finishing containers' blowing. 7. Hydraulic System: Hydraulic system adopts proportional controlling loop for conveniently setting up motion pressure. Main oil pump adopts dual vane pump, big pump supplies forces for motions like open/close mould, up/down moving mould, up/down lifting platform, blowing descending, etc. to improve system running speed. Small pump supplies clamping force and save energy consumption much. The hydraulic pumps and valves have been equipped onto our extrusion blow molding machines for many years to guarantee precise control, stable running, low malfunction rate. The oil pipes adopts attaching burke joint to insure non-leakage of oil loop system. Such hydraulic system is high efficient, energy saving, reliable.